Timehri residents, who once feared being forcibly removed from near to the Cheddi Jagan International Airport (CJIA) because of the ongoing US$150M expansion project, are breathing a sigh of relief as government has begun constructing new houses for them. 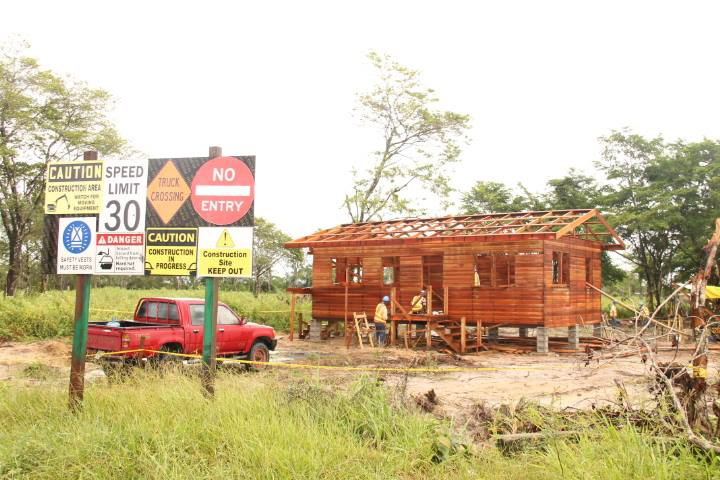 “It is in phases, but I would expect that it should be completed by [year-end],” Minister of Public Infrastructure David Patterson told Stabroek News yesterday, after an airport expansion project site visit. 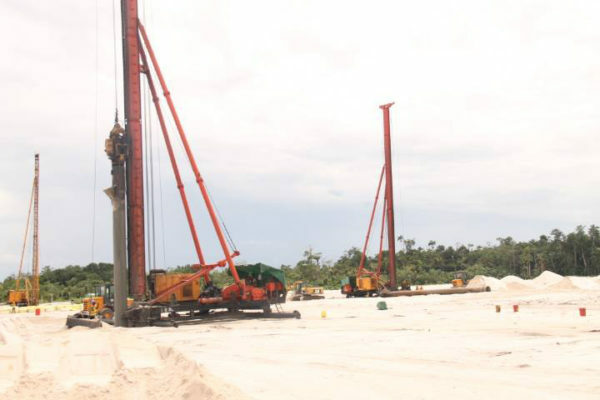 The Public Infrastructure Minister said that expansion work at the CJIA has been continuing apace and he led a team, comprising officials of the CJIA; engineers and officials of the contracting company, China Harbour Engineering Company (CHEC); the Environmental Protection Agency (EPA); the Guyana Civil Aviation Authority and the Guyana Defence Force (GDF), on a site visit yesterday. 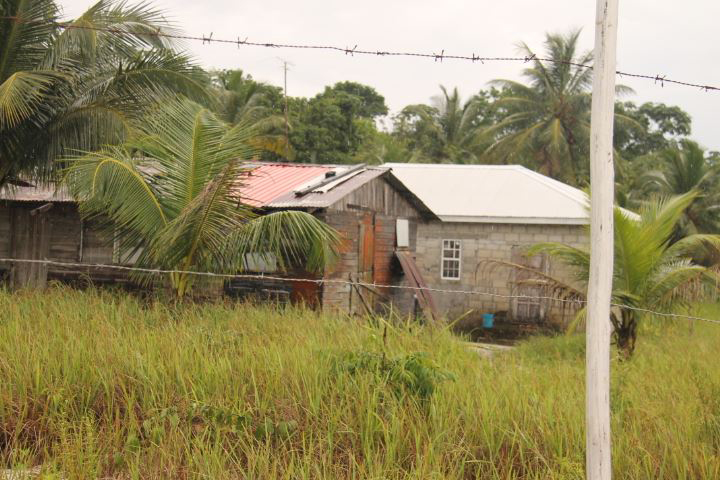 Stopping at a housing development area, a short distance away from where the current residents live, Patterson pointed out that a relocation housing scheme was being developed for those encumbering the current expansion. Timehri North residents had complained from the onset of the project, back in 2011, that the then People’s Progressive Party/Civic government was demanding their removal without word of where they could relocate. It created a bitter dispute between the residents and the then government as they argued that their families lived for as much as 40 years at the location and depended on the lands for cash crops. Patterson said that the area, called in the interim the Airport Relocation Scheme, has the capacity for 57 house lots but after analysis it was found that only 19 homes needed to be moved to facilitate the specified expansion. Those 19 families will be moving into houses, similar to their old homes, before the end of 2016. “No one will be shortchanged so if you had a 10 by 10 wooden house, we will rebuild for you a 10 by 10 wooden house and so forth,” he said. In addition to the relocation of the 19 families, the police outpost and the GDF Engineering Corps have already shifted to provide for the expansion of the departure and arrivals building. Additionally, the road which leads to the Jubilee Resort will be diverted to facilitate the expansion. Meanwhile, Patterson and experts leading the expansion of the airport assured that when the runway is extended, it would be safe and durable. Project Manager of the Ministry of Public Infrastructure (MPI) Carmichael Thorne explained that vibroflotation was being used as the ground improvement method for the compaction of the sedimentary soil, which has high water content at parts of the site. Through this method, white sand, sourced from a nearby sandpit and supplied by nine sub-contractors, will be compacted and used as the backfill for the needed bearing capacity required for the runway construction. Patterson said that the level of elevation of the soil needs to go up 29 meters from the ground to meet the current runway height. He said that currently the construction is at 21 meters and they hope by the end of this year to be at ninety percent. Technical Adviser to the Ministry Walter Willis and an official of the consulting firm MMM explained that the vibroflotation method was the best for making ready for construction the non-cohesive soil type for the proposed 1,090 metres extension of the airport runway. The oversight engineer of MMM said that as of yesterday, all construction works were on target and met desired building specifications for the expansion design. “We are monitoring the construction as we go and we have certain requirements in our specification and testing is being done, absolutely,” he said. “Don’t forget the Ministry of Public Infrastructure also has oversight of the contractor and on the consultant by our agency MPI and CJIA, so there is a whole tier of monitoring…from our past experiences also we have also tried to increase,” Willis said. It is because the ministry intends to increase its vigilance of contractors’ construction works that it also announced that it was in the process of establishing its own works inspectorate. “Interviews for recruitment are ongoing,” Willis added. The main concern of the opposition’s representative, Juan Edghill, who was present during the visit after being invited, was the likelihood of government expending more than the sums appropriated for the project and whether they would meet the December 31st, 2017 timeframe given. “For this project $4B was allocated to be spent in 2016…$2.8B has been certified to be disbursed…and based on the schedule, we are very confident that we can spend the other $1.2B on the CJIA,” Patterson responded to questions on the allocations. “At the moment we are holding everybody to schedule,” he further added.